Could big Stef be the answer for R2? Since the beginning of the decade, only one ruckman can claim the honour of owning the highest average for an entire AFL Fantasy season. No, not Brodie Grundy, or Max Gawn, or even throwback Todd Goldstein. I’m talking about Stefan Martin who since the turn of the decade has paved the way for other big men to be relevant in the fantasy world. Over the last five seasons, Martin has finished inside the top-4 scoring wise (on average) for ruckmen, an honour that no other ruck can claim. While going at 102.4 throughout those five seasons might not scream ‘must-have player’, any non-midfielder who can boast close to a triple figure average over a lengthy stint of games (96 to be exact) is worth including in your pre-season calculations. Back in 2015, Stef was at his peak, putting forward his second straight season AVERAGING 110+, which saw him claim the mantle as the highest averaging player in the game. Why do his 2015 averages matter you ask? Because since that time, Martin has continued to produce. Even in an injury infected 2016, when we saw Trent West steal some of his valuable time in the middle Martin closed the year on fire, scoring at an average of 103.8 and only going under triple figures once in his last eight contests. Playing nice with others hasn’t been a strong suit of Martin’s but it hasn’t completely derailed his scoring either. In the last two seasons, Archie Smith and Oscar McInerney have combined to play in 22 contests with Martin averaging 94.7 alongside, nothing to be sneezed at that’s for sure. In the other half of his games, Martin went at an average of 106.4, not only highlighting the points bonus when he plays solo but indicating there isn’t a huge difference if Brisbane plans to run out a dual ruck lineup. There’s no guarantee the Lions will utilise two rucks either with Josh Walker trying his hand as a backup ruckman over the last few years until he found his niche playing in the backline last season. Archie Smith failed to play a senior game at all in 2018 and while Oscar McInerney played 16 games, he only averaged a shade over 50 points, so I’d still expect the big unit that is Martin to see the majority of his minutes inside the centre circle unless anything goes pear-shaped. While niggles and small injuries are worrying for a man of Martin’s stature, the Lions jet has only missed four games in the past four years and some could argue that 2018 was the best all-around season of his career. Even though there are some blemishes, Martin’s ability to hit the fantasy scoreboard in a variety of ways makes him a unique talent. Two of those three scores came with McInerney in toe as well, giving us cautious optimism that Martin can be a reliable R2 regardless of who else is on the ground in a Lions guernsey. While Martin’s scoring has been a picture of consistency in years past he has had his off days. Injuries can be blamed for a lot of his low scores as we saw in 2016 when he averaged just 89 for the year, a far cry from the triple figures we are accustomed to seeing from Martin. 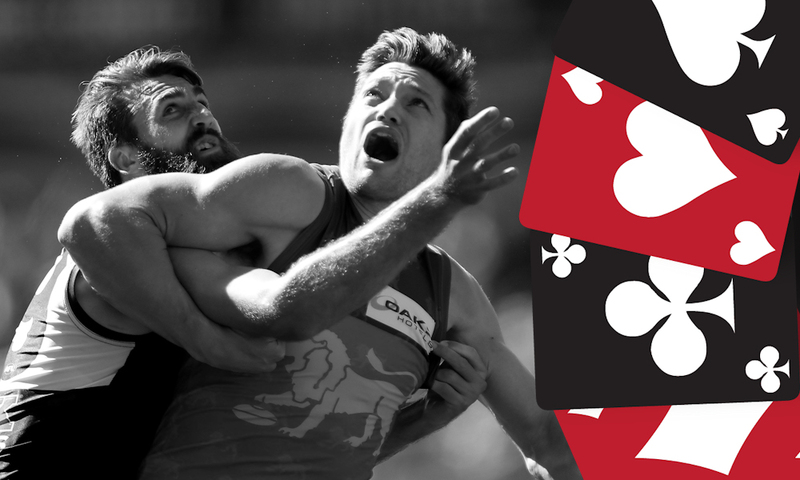 It’s no surprise to find that the big unit averaged his lowest time on ground (TOG) percentage in 2016, however, there was barely a difference compared to his more fantasy-friendly campaigns. There isn’t a huge reason to get excited about starting with Stef either. Priced at an average of 101 even if Martin goes over that, it’s unlikely that he’ll eclipse the coveted 110 barrier. There is plenty of value to be in the ruck department this season with players like Sam Jacobs and Justin Westhoff already previously discussed in the Deck of DT and a handful of others emerging as solid money making plays. While Martin should, at worst, maintain his avearge he shapes as a great upgrade target later in the season rather than a starting ruck choice. KING – Four averages in triple figures throughout the past five seasons gives me faith that Stef can still hold his spot in the holy trinity of rucks alongside Brodie Grundy and Max Gawn. However, starting with him isn’t a surefire strategy considering his age, role and the value availble for our second ruck spot. That doesn’t mean Martin won’t be one of the top fantasy ruckman this season, but it does mean the smart play is to view Martin as an upgrade target rather than paying big and starting with the big fella. FOLLOW ME ON TWITTER: @SportsbyFry for all thing AFL Fantasy (and more). Got something to say about the deck? Use the hashtag… #DeckofDT. Polec or rocky and chance for a good year?